One of the great wonders of the American West is Antelope Canyon, within the Navajo Nation in northern Arizona. Parts of Upper and Lower Antelope Canyon form into “slot canyons”, one of Canyon Country’s most exquisite and unusual phenomena. Slot canyons are exceedingly narrow, sheer-walled sandstone canyons, sometimes only a few feet wide and hundreds of feet high. These constricted canyons can cause spectacular flash floods during the occasional powerful summer storms in the region. The force of the floodwaters combined with eons of time carves and polishes the canyon’s sandstone walls into exquisite shapes. The canyon shadowy walls combined with sunlight beams that penetrate the canyon often create scenes of unbelievable and surreal natural beauty. As the day goes on, changing light angles create a kaleidoscope of patterns and colors. A short section of Upper Antelope Canyon (about 1/4 mile) is exceedingly narrow and convoluted and is considered by many to be the most beautiful and photogenic slot canyon in the world. There are those who consider it almost a religious experience. A noted landscape photographer calls it “…a place of celebration for the eye, mind, and spirit”. However it doesn’t take a professional photographer to be inspired here or to shoot a great picture (See photography tips on Page 2). 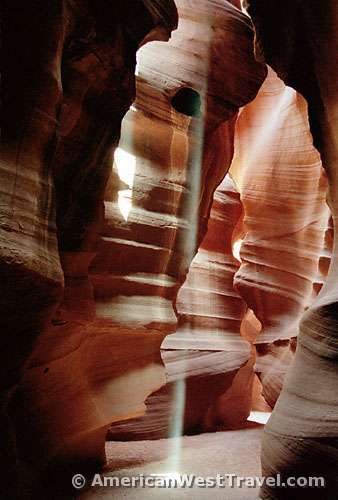 Unlike many slot canyons, Upper Antelope Canyon is accessible and easy to visit. Its flat sandy bottom allows easy access to anyone. You simply walk up a wash and then into a hillside. 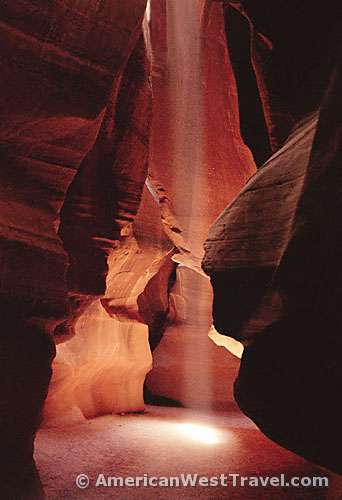 Many slot canyons are filled with obstructions such as debris, deep pools of standing water, and quicksand. You need to be a serious outdoors person to negotiate such canyons. The disadvantage here is that you might not get the requisite privacy to be “inspired”. (Left) The north entrance to the narrows of Upper Antelope Canyon does not betray what’s inside. The areas above and below the narrow section are wide open washes. Access to Antelope Canyon is by guided tour only. The Navajo Nation is very strict on this point after a terrible flash flood in 1997 caused many fatalities. Professional guides know that the canyon is safe before entering. 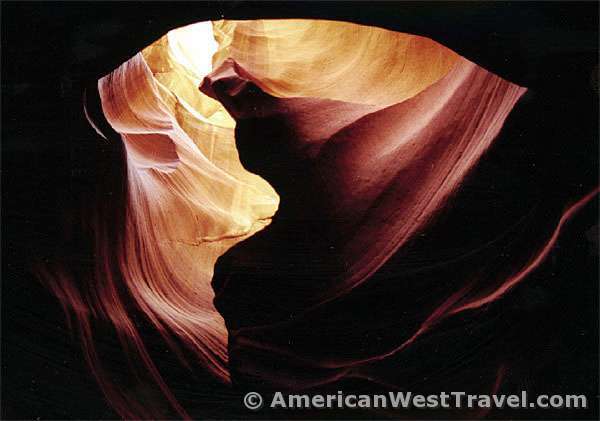 Several operators offer inexpensive tours to Upper Antelope Canyon out of nearby Page, Arizona. One guide is available near the canyon entrance off the main highway (AZ-98). Some tours specialize in helping you take outstanding pictures. 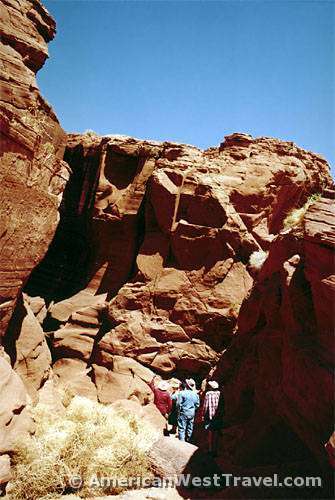 The upper canyon tour lasts about two hours. The lower canyon offers a slightly more difficult hike, which requires descending on ladders.